England women captain Charlotte Edwards said defeat in the final match of the tour should not detract from their Ashes-winning performance in Australia. 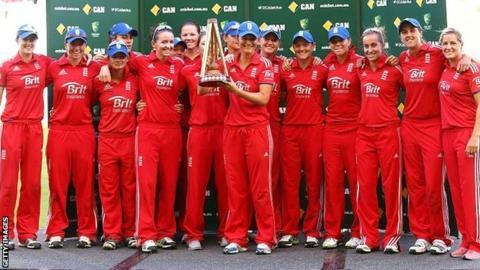 England lost the final two Twenty20 matches against Australia but won the points-based multi-format series 10-8. "I hate losing - as I should, and as should the team - but we've a lot to be proud of," Edwards told BBC Sport. "This seemed a long way off a few weeks ago and to stand here with that trophy again is pretty special." England could only muster 101 from their 20 overs in Sydney, Natalie Sciver top-scoring with 28, and Australia reached their target with nine balls to spare. "I'm disappointed, we should have got up to 120-130," Edwards said. "We stuck with it with the ball and it wasn't easy to score once the slower stuff was on so it was a disappointing day, but looking at the whole series we've got to be very proud of what we've achieved." Despite closing with two defeats, England were always ahead in the series, having won the one-off Test match in Perth to earn six points, and moved 8-0 ahead by taking the opening one-day international in Melbourne. They secured their second successive Ashes-series victory with a nine-wicket win in the opening Twenty 20 in Hobart on 29 January. Commenting on the closing defeats, with a squad depleted by injuries, Edwards added: "It has taken a bit of the gloss off receiving the trophy but quickly you have to remember back to Perth and back to the ODIs and Hobart, where we managed to play so well. "It's been a really tough four weeks - the Test match took a huge amount out of our young attack and ultimately we've been trying to claw it back since then. The girls have stuck together and to win out here back to back is pretty special." Attention now turns to the ICC Women's World Twenty20, which begins in Bangladesh on 16 March, as England attempt to regain the title they won in 2009, when the inaugural competition was staged on home soil. "These two games in a couple of months' time might be a blessing in disguise to show we've still got a little bit of work to do," Edwards added. "If we get Anya [Shrubsole] back it looks a totally different team and we've got to get home, get everyone fit and well and come ready and raring to go for Bangladesh."